By the time Gainsborough left Bath for London three years before this portrait, his style had become looser and more expressive and his portraits less formal. This change is evident here in the freely painted satin gown and powdered hair of Lady Clarges and the blurring of her harp-playing fingers. Eighteen-year-old Louisa Skrine’s portrait was painted for Sir Thomas Clarges the year after their marriage. 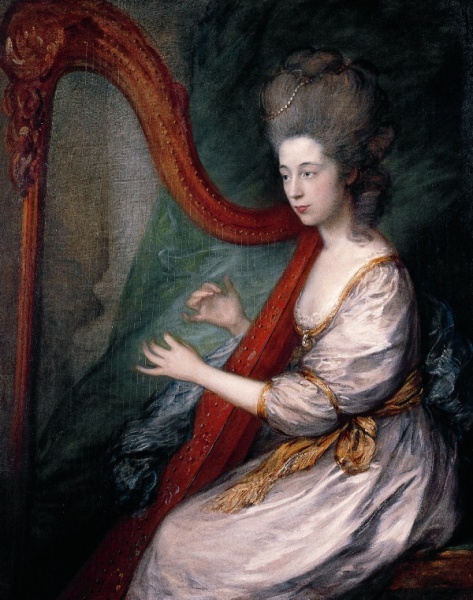 Brought up at Warleigh Manor near Bath, Louisa became an important patron of musicians.